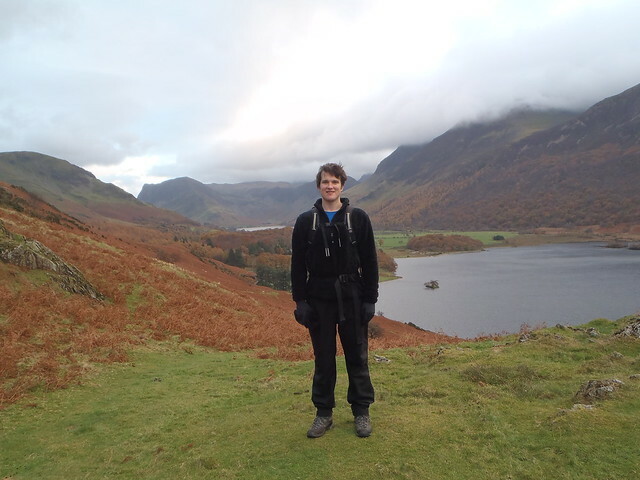 A month ago I'd never been to Buttermere. It's odd how without really planning it I ended up, on two separate occasions, driving over the Newlands Pass and parking up in this valley. The trees are in full on autumn gorgeousness and this is a very beautiful place to visit. Conrad and I parked at Gatesgarth and headed up to Grey Crag. I had great fun splashing through puddles and squelching through boggy bits. Always fun but it was especially enjoyable as Conrad squirmed about trying to avoid getting his feet wet in his fancy approach shoes. I stayed smug and dry-footed in boots. 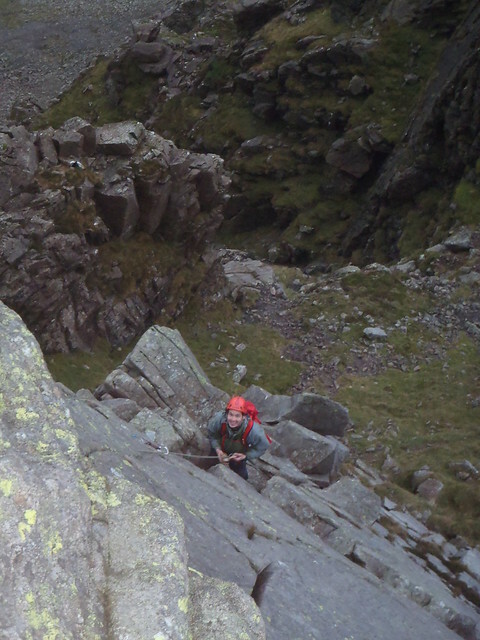 We selected Grey Crag on the basis that you could run together several easy multi-pitch routes. The forecast looked like it might stay drier in the north. It had rained heavily the night before and everything was still a tad damp. We climbed Harrow Buttress (Diff**) and then Slabs Ordinary (V Diff) and finally Oxford and Cambridge Direct (Severe***). It was nice to have the slowly escalating difficulty and the quality of the routes improved each time. As we went higher the routes dried out with O and C being exposed to plenty of wind. We each had our scary moments (appropriate for Halloween). On the second pitch of Slabs Ordinary, Conrad climbed off around the corner for rather too many metres above the belay without finding any decent protection. The scary moment for me came on the crux of the last pitch of O and C. Conrad later commented that he watched me stop on the ledge and just look at the wall for a few seconds longer than is reassuring. I wasn't trying to put gear in. I wasn't trying out hand holds. He decided that wasn't a good sign. For me the slightly terrifying part was when I decided to take a peak on the right side of the arête and see if there were any holds around there. There weren't. There was a long steep drop. And then there was a big gust of wind. Somehow I got the bottle together to climb to the top and almost as soon as Conrad followed me up, it began to pour with rain. We'd timed it perfectly. It would have been even scarier on that arête if there was a river flowing down it. 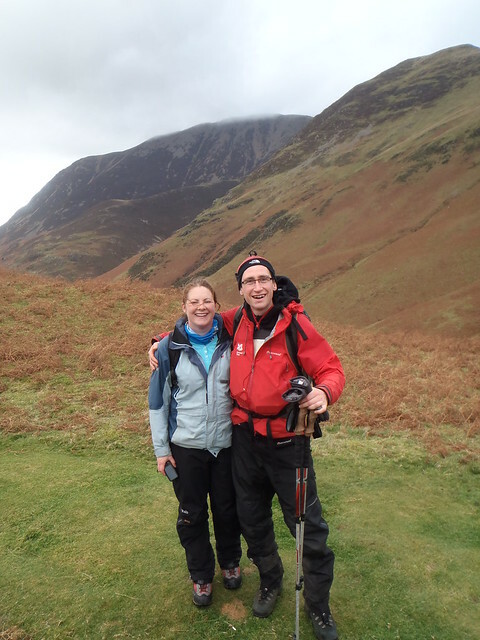 Jamie and Laura have been collecting Wainwrights. I had a glimpse into their game with a great day's walking. Like with Munro bagging, there is a list of the peaks written about in Wainwright's famous Lakeland guidebooks you can go about tramping up and down and ticking off. Jamie has a map with little red marks on the hills he's been up. 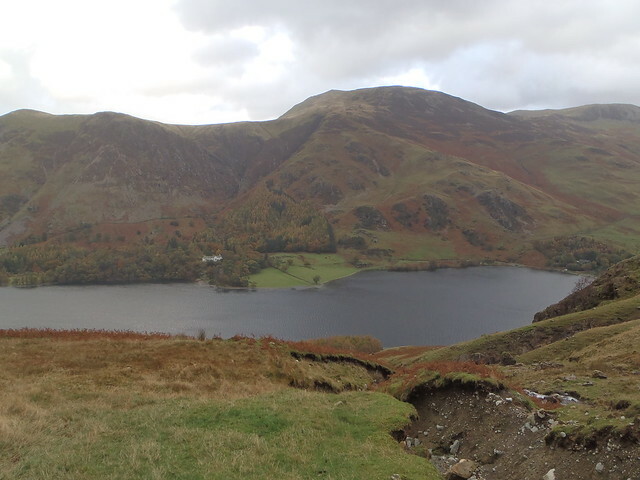 There was a blank spot on a few just east of Crummock Water for us to get our teeth into. First up was Whiteside. It felt like a bit of a slog heading up that path so it was good to have a pause and hear about the flora. Laura is a botanist and Jamie is a ranger. Between them they know a fair bit about the small things growing around you on the hill and also about the big things growing down below. "See those trees that look like conifers but their leaves have gone brown? Most of those are larch." says Jamie. "All of those are larch," corrects Laura. Down at our feet we spot some moss. I incorrectly identify some sphagnum moss (the only one I've heard of) but it turns out it is Polytrichum. While I'm forgetting how to say that we see some Club Moss, a Juniper tree (almost endangered - how are we going to make gin?!) and Geographica lichen (which looks like little continents). We spotted an exciting rocky looking ridge from the slog and were pleasantly surprised to find it was an exciting rocky ridge as we walked along it to Hopegill Head and then down to a broad col where some boulders provided a sheltered picnic spot. The walk continued over Grasmoor. The clag came down and we got the compass out and timed our pace as we followed a bearing. 9 minutes and 34 seconds later we found our path. It was 26 seconds early. The visibility returned as we followed the ridge over Wandope and Whiteless Pike. Sadly there was no more need for the geeky navigation practise. Unlike the Munros which are defined to be mountains over 3000 feet. Wainwright just chose the big fells and the ones he liked. So we get Rannerdale Knotts to walk over even though it's a piddly 355m. But it is well worth it. The views down the valley to Buttermere, with Haystacks and High Crag behind, are the best of the day. And the peak itself has the character of something much bigger with plenty of craggy bits and a few photogenic sheep. Jamie tells me the sheep are Herdwick which is a Viking word meaning sheep pasture. The "wick" bit can also be "vik" and it means bay or fjord. This is used a fair bit with place names like Wick and Lerwick and in the word "Viking" itself which means "one who comes from the fjords". I wondered about the red spray paint most of the sheep seem to have on them. Laura reckons they put a load of ink on the chest of a ram. The ink comes off when the ram mates and the farmer can easily see which ewes have been shagged. 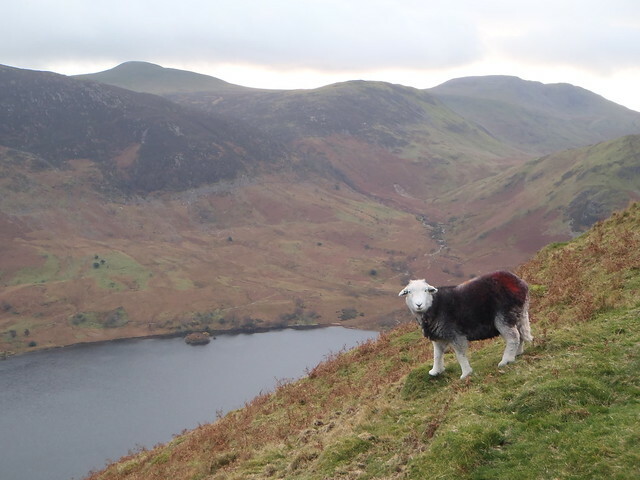 I'm a convert to Buttermere, and I'd like to come back and try the ice cream.